Despite the tremendous teachings on the benefits of tithing, why is it that many families and fellowships today are barely able to “stay afloat” each month? Up front, I submit to you that there is no single answer to this troubling question. 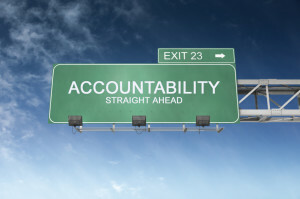 I do want to explore a critical aspect of stewardship which I believe has been forgotten in all the activity of family & ministry today… accountability. Stewardship, as most of us understand, means someone is responsible for handling the resources belonging to another. As Believers, we understand that stewardship means we are responsible for handling the resources which Almighty God has entrusted to our care. This means we do not have the authority to make decisions regarding God’s resources unless He gives his permission for us to do so. Just having money in the bank does not entitle us to spend it as we see fit. How many of us have done this? Sounds simple enough, right? So where did we miss it? Precious ones, we stray from the right path when we believe the resources at our disposal belong to us, therefore we can do with them as we please. In this we greatly err. Probably the best way to think of accountability is to view it as a “safety valve”, or a “safety net”. This principle applies equally to families, fellowships, companies, or government at all levels. The only difference between these is the scale and the level of responsibility given to the steward. To whom much is given, much is also required (Luke 12:48)! At the family level, husbands and wives must be in agreement with a wide variety of issues regarding stewardship if the family is to be successful. If there is no agreement, then the matter discussed should not be acted upon until full agreement has been reached. This could be a car purchase, job change, or the like. Please note: true agreement is not one “giving in” to the other. Wives often believe they must do whatever their husband says because he is the head of the family. Lady, before God, you are equal. The husband may make the ultimate decision, but he must not disregard his wife’s counsel. Though all church fellowships have some sort of leadership structure, many do not openly discuss matters as a leadership team before decisions are made. The reasons for this vary, but the fruit is a lack of God’s power, resources, and presence. Like the family example above, church fellowships often rise or fall based on accountability within the leadership team. There must be openness and a trust relationship among the leaders. After discussing matters together, the team must bring these matters before the Lord to receive His counsel. If there is a lack of agreement among the leadership, then changes, ideas, or other matters must not go forward until true agreement is reached. Because of the unique calling of each fellowship, God Himself provides whatever is needed to ensure the success of that house. Put another way, God Himself will underwrite all the necessary finances, people, skills, and of course the leadership to bring it all together. Unfortunately, it is quite easy for a church to get off track over time. The best way to ensure this does not happen is to ensure the leadership regularly discusses matters, prays together, and does not make changes until agreement among the entire team is reached. If the Lord does reveal something is off track, the proper response is not only quickly asking the Lord’s forgiveness, but also forgiveness of the other leaders as well. You see, the leadership is accountable to each other. It takes humility (the opposite of pride) to ask for forgiveness. Asking for and receiving forgiveness seals the breach in the team , thus ensuring the enemy does not have entrance. This same principal works between husband and wife too! The next step is to make the necessary changes (as a team) to return the fellowship back to God’s original blueprint. Have you ever read in Romans 11:29 where it says “the gifts and callings of God are without repentance”? This verse not only applies to individuals, but to churches as well. In closing, accountability can bring tremendous peace to a family because neither spouse feels like they are making decisions alone. True agreement between husband, wife, and the Lord provides peace. This peace is the “go ahead” the husband and wife need to know they can safely launch out into what God has ordained for them. In a church fellowship, accountability helps ensure the calling of the ministry stays true. Decisions are made by the entire team, thus the chance of deception by the enemy is vastly reduced. In both cases, accountability helps establish the Kingdom of God, which is what each one of us continually prays for (Matthew 6:10). ACCOUNTABILITY, n. 1. The state of being liable to answer for one’s conduct; liability to give account, and to receive reward or punishment for actions. The definition itself has caused me to rethink my thoughts and actions. Thanks for sharing. Awesome ! Just in time . I thank God for the Heart of this ministry ,which has and continue to be a blessing in my life even when I’m miles away ..Thank you so much .. Thanks, Guillermo! Be sure to sign up for the upcoming course “God’s Plan for Money” to get a fuller dose!